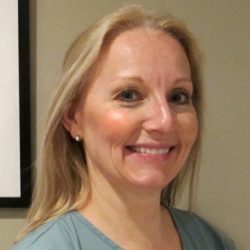 Susan Allen, Registered Massage Therapist is a graduate of The Canadian College of Massage & Hydrotherapy, Cambridge Campus. She is passionate about the natural benefits of massage therapy and is pleased to be working in a clinic where an integrative model to client care is offered. Susan provides a clinic-based approach to treatment which includes a thorough review of the client’s health history, a postural assessment, range of motion and special orthopedic testing (as required), along with recommendations for home self-care to aid in the success of treatments. She encourages her clients to ask questions and is always eager to help them understand the source of their discomfort. Susan continues to expand her skills through on-going education and is always excited to share the benefits with her clients.